Inspired by the Tree of Life, this pewter set will make favorite family recipes that much more delectable. Some of the best family memories are made in the kitchen. And the best baked goods. 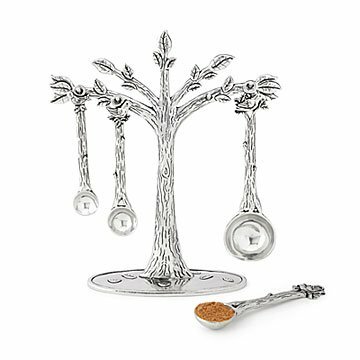 Inspired by the Tree of Life, Bonnie Bond and John Caraberis pewter measuring spoon set will make your favorite recipes—Grandma’s peach cobbler, your signature birthday brownies—that much more delectable. Handmade in Nova Scotia, Canada. Bonnie Bond and John Caraberis have been designing and crafting pewter for over 25 years. From their studio in the harborside village of Pugwash, Nova Scotia, the couple make products that touch the heart and delight the spirit. "Maybe it’s the daily ebb and flow of our tides," they say, "that renews our hope for peace in ourselves and in our world."